At age 6 I learned to ride a bike. By 14 I’d like to think I mastered the perfect cross court forehand. At 18 I finally learned to cook for myself after learning that cheese sauce was not simply made my melting cheese. But at 21? At 21 I finally learned how to really look after myself. I got a beauty routine. It’s not religious or vigorous but now I know what products really do work for me. Although I’ll probably never stop experimenting or trying new products here are the ones I always end up coming back to. First up, is my list of essential hair products. I’ve been bleaching my hair for years – and although I love being blonde it’s really easy to become obsessive about about shampoo and conditioner to counteract the dryness and split ends that come with highlights. Recently I started using Kerastase and saw a massive difference. I bought the Bain de Force shampoo and the Ciment Anti-Usure conditioner from Active Beauty – they usually have great Kerastase discounts running so it makes parting with the pennies that little bit easier. Both products are made especially for chemically weakened hair, smell fantastic and still haven’t run out after 2 months. An extra tip – during the winter months scalp’s can get pretty dry. I recommend using E45 Dermatological Dry Scalp Shampoo regularly, I often use it before my Kerastase shampoo. Another piece of great advice would be to stop using dry shampoo – it’s so drying! Instead I now use Johnson’s Baby Powder. It’s much cheaper than buying dry shampoo and a little goes a long way so the same tub will last a lifetime. For blowdrying hair I can’t recommend BaByliss New Big Hair Spinning Brush enough. The product promises high shine, plenty volume and a smooth finish. It’s the closest I’ll get to salon quality hair at 8am! To protect it from the high heat I also use L’Oreal Elnett Heat Protect Spray Volume which helps keep my blowdry in place. The Essential List will continue with Make-Up and Skin Care so stick around for that post! 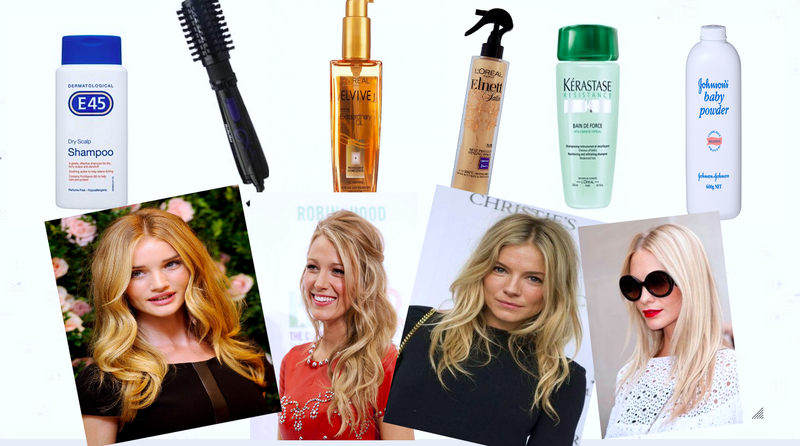 This entry was tagged best hair products, blake lively hair, dream celeb hair, hair essential, hair products reviews, poppy delevingne hair, rosie huntington-whitely hair, sienna miller hair. Bookmark the permalink.